Celebrities! They’re just better than regular people. Not only do they have the life we all dream of, sometimes they take that downtime between movie shoots or recording sessions to become great at something else we plebes long to master. Like cooking! Honestly inspired by the revelation that Vincent Price once cooked a fish in a dishwasher many moons ago, we decided it would be fun to dive into some legendary recipes by famous types. 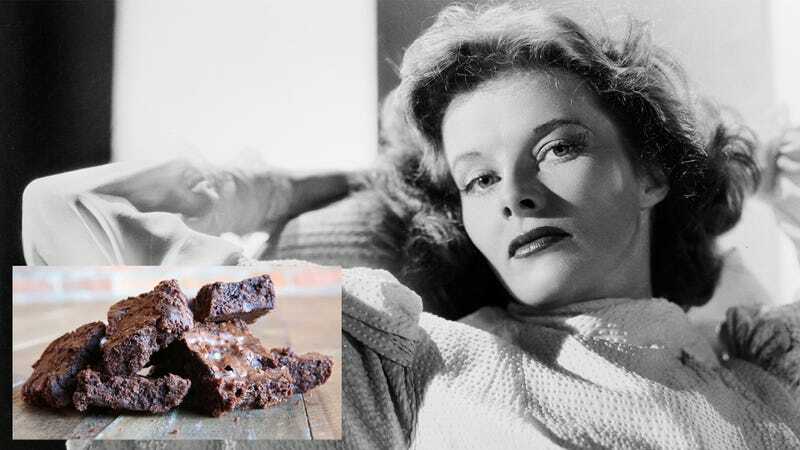 To kick things off, we decided to go with the greatest celebrity recipe of them all: Katharine Hepburn’s brownies. This recipe was first published in The New York Times after Hepburn’s death in 2003, and has a pretty terrific story behind it. Turns out writer Heather Henderson’s father lived in the same new York neighborhood as Miss Hepburn. When Heather wanted to drop out of Bryn Mawr, her father got his famous neighbor and fellow Bryn Mawr alumna to talk her out of it, and they became if not friends, then friendly acquaintances. When Miss Hepburn suffered a fall, Mr. Henderson brought her some brownies. His charity was immediately greeted with a critique that his brownies were too floury by the famously brusque and candid star, who quickly rattled off her own brownie recipe, repeated below. We can only imagine that a force of nature like Katharine Hepburn—fond of brisk, miles-long walks in the woods, never slowing down for an instant—did not have a ton of time to mess around in the kitchen. Subsequently, her brownies are simple, no-nonsense, and can be thrown together in about 15 minutes. But like her, simple does not mean plain here, but classic: The immediacy and brevity of these brownies does nothing to deter how wonderful they are. The melting of the butter means they couldn’t be easier to stir together, and the minimal flour does indeed result in brownies that are exceptionally chewy and moist, almost fudgy. They’re a little hard to handle, but delicious—just like Kate The Great herself. We don’t favor walnuts, which Hepburn probably harvested herself from her own New England farmland, but threw in some mini-chocolate chips instead. We might be tempted to add some heavy-duty cinnamon if we weren’t afraid that she would come back from the grave and haunt us for messing with her famous recipe. Since the ingrates we live with are going to demolish anything chocolate-related, we took Miss Hepburn’s brownies to the Onion staff for a more discerning opinion. They were as big a hit at the office as they were at home. Our colleagues agreed that the brownies tasted fudgy, “velvety,” “torte-like,” “like a cross between fudge and a brownie”; one taster rightfully called them “medium rare.” Another enthused over that softness of the brownie, as “most are over-baked”; this one “tastes the way a brownie should,” a “grown-up brownie” (that our kids loved anyway). Likely the most inspired comment came from the taster who surmised that the recipe was obviously from “someone with class.” We couldn’t agree more. Preheat oven to 325 degrees. Melt butter in saucepan with cocoa and stir until smooth. Remove from heat and allow to cool for a few minutes. Mix in eggs, one at a time. In a separate bowl, combine the sugar, flour, nuts, vanilla and salt, and add to the egg/chocolate mixture. Pour into a greased pan (Hepburn’s recipe calls for a square 8"x8" pan, but I only had a rectangular glass pan. Still turned out great.) Bake about 35 minutes, being careful not to overbake; they should be gooey. Let cool and cut into bars. This is a small batch, makes about 12.